Flexistipes sinusarabici Fiala et al. 2000 is the type species of the genus Flexistipes in the family Deferribacteraceae. The species is of interest because of its isolated phylogenetic location in a genomically under-characterized region of the tree of life, and because of its origin from a multiply extreme environment; the Atlantis Deep brines of the Red Sea, where it had to struggle with high temperatures, high salinity, and a high concentrations of heavy metals. This is the fourth completed genome sequence to be published of a type strain of the family Deferribacteraceae. 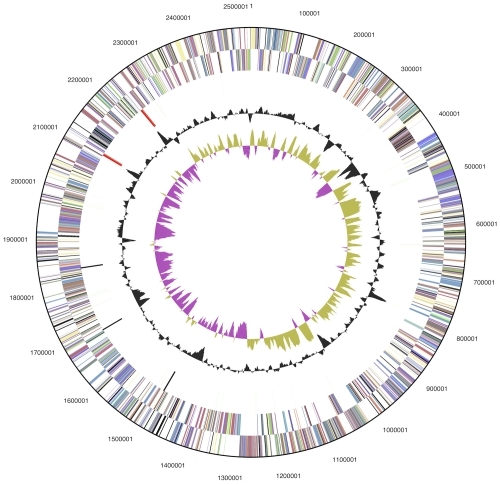 The 2,526,590 bp long genome with its 2,346 protein-coding and 53 RNA genes is a part of the Genomic Encyclopedia of Bacteria and Archaea project. Strain MAS10T (= DSM 4947 = ATCC 49648) is the type strain of Flexistipes sinusarabici [1,2] which is the type and only species of the genus Flexistipes [1,2]. The strain was first isolated from the Atlantis II Deep brines of the Red Sea , together with four related isolates. The generic name derives from the Latin words flexus, a bending, turning, winding, and stipes, a branch of tree, stick . The species epithet is derived from the Latin words sinus, a curve or fold in land, a gulf, and arabicus, Arabic, describing the place of isolation . Since the time of its isolation in the late 1980s until now no closely related bacterium (16S rRNA identity >90%) was described. The resistance of the strain to moderate heat, high salt concentrations, and heavy metals  should make it an interesting target for extremophile biotechnology. Here we present a summary classification and a set of features for F. sinusarabici MAS10T, together with the description of the complete genomic sequencing and annotation. A representative genomic 16S rRNA sequence of strain MAS10T was compared using NCBI BLAST [3,4] under default settings (e.g., considering only the high-scoring segment pairs (HSPs) from the best 250 hits) with the most recent release of the Greengenes database  and the relative frequencies of taxa and keywords (reduced to their stem ) were determined, weighted by BLAST scores. The most frequently occurring genera were Acidithiobacillus (60.0%), Deferribacter (26.8%), Flexistipes (8.2%), Desulfuromonas (2.2%) and Calditerrivibrio (1.8%) (80 hits in total). Regarding the single hit to sequences from members of the species, the average identity within HSPs was 98.0%, whereas the average coverage by HSPs was 96.9%. Among all other species, the one yielding the highest score was Deferribacter abyssi (AJ515881), which corresponded to an identity of 89.7% and an HSP coverage of 86.4%. (Note that the Greengenes database uses the INSDC (= EMBL/NCBI/DDBJ) annotation, which is not an authoritative source for nomenclature or classification.) The highest-scoring environmental sequence was FR744611 ('succession potential reducers nitrate-treated facility determined temperature and nitrate availability production water Halfdan oil field clone PWB039'), which showed an identity of 96.7% and an HSP coverage of 93.1%. The most frequently occurring keywords within the labels of all environmental samples which yielded hits were 'microbi' (3.9%), 'acid' (3.4%), 'sediment' (3.3%), 'water' (3.0%) and 'oil' (2.4%) (170 hits in total). The most frequently occurring keyword within the labels of those environmental samples which yielded hits of a higher score than the highest scoring species was 'avail, determin, facil, field, halfdan, nitrat, nitrate-tr, oil, potenti, product, reduc, success, temperatur, water' (7.1%) (1 hit in total). While these keywords fit to the marine environment from which strain MAS10T originated, they also point to sediments and oil fields which were so far not considered as habitats for F. sinusarabici. Figure 1 shows the phylogenetic neighborhood of F. sinusarabici MAS10T in a 16S rRNA based tree. The sequences of the two identical 16S rRNA gene copies in the genome differ by two nucleotides from the previously published 16S rRNA sequence M59231, which contains 25 ambiguous base calls. Phylogenetic tree highlighting the position of F. sinusarabici relative to the type strains of the other species within the phylum "Deferribacteres". The tree was inferred from 1,459 aligned characters [7,8] of the 16S rRNA gene sequence under the maximum likelihood (ML) criterion . Rooting was done initially using the midpoint method  and then checked for its agreement with the current classification (Table 1). The branches are scaled in terms of the expected number of substitutions per site. Numbers adjacent to the branches are support values from 250 ML bootstrap replicates  (left) and from 1,000 maximum parsimony bootstrap replicates  (right) if larger than 60%. Lineages with type strain genome sequencing projects registered in GOLD  are labeled with one asterisk, those also listed as 'Complete and Published' with two asterisks [14-16]. Classification and general features of F. sinusarabici MAS10T according to the MIGS recommendations  and the NamesforLife database . Cells of strain MAS10T are straight to bent rods, about 0.3 μm wide and 4–50 μm long (Figure 2) . F. sinusarabici was described as non-motile . Spore-formation was not observed . MAS10T cells stain Gram-negative, and growth is strictly anaerobic, with the best growth occurring within a temperature range of 45–50°C and a minimum doubling time of 8 ½ hours . Optimal pH range for the strain is pH 6-8 . Strain MAS10T requires at least 3% NaCl for growth, but also grows at salt concentrations as high as 10% . The organism prefers complex growth substrates such as yeast extract, meat extract, peptone and tryptone, while formate, lactate, citrate, malate, carbohydrate, amino acids and alcohols do not support cell growth . Strain MAS10T shows an unusual resistance against the transcription inhibitor rifampicin , which is however also commonly found among the spirochetes. The chemotaxonomic data for MAS10T is relatively sparse: No information on cell wall structure, quinones or polar lipids is available. The fatty acid composition is dominated by saturated unbranched acids: C18 (23.3%), C16 (15.1%), C17 (12.6%), with some branched acids iso-C14 (10.2%), anteiso-C15 (10.2%), iso-C16 (4.1%), iso-C15 (3.6%), and few unsaturated acids C18:1 (9.9%), C16:1 (2.8%), C17:1 (2.5%) . F. sinusarabici MAS10T, DSM 4947, was grown anaerobically in DSMZ medium 524 (Flexistipes Medium)  at 47°C. DNA was isolated from 0.5-1 g of cell paste using Jetflex Genomic DNA Purification Kit (GENOMED 600100) following the standard protocol as recommended by the manufacturer, but adding 10µl proteinase K for one hour extended lysis at 58°C. DNA is available through the DNA Bank Network . The genome was sequenced using a combination of Illumina and 454 sequencing platforms. All general aspects of library construction and sequencing can be found at the JGI website . Pyrosequencing reads were assembled using the Newbler assembler (Roche). The initial Newbler assembly consisting of 175 contigs in two scaffolds was converted into a phrap  assembly by making fake reads from the consensus, to collect the read pairs in the 454 paired end library. Illumina GAii sequencing data (489.7 Mb) was assembled with Velvet  and the consensus sequences were shredded into 2.0 kb overlapped fake reads and assembled together with the 454 data. The 454 draft assembly was based on 170.4 Mb 454 draft data and all of the 454 paired end data. Newbler parameters are -consed -a 50 -l 350 -g -m -ml 20. The Phred/Phrap/Consed software package  was used for sequence assembly and quality assessment in the subsequent finishing process. After the shotgun stage, reads were assembled with parallel phrap (High Performance Software, LLC). Possible mis-assemblies were corrected with gapResolution , Dupfinisher , or sequencing cloned bridging PCR fragments with subcloning. Gaps between contigs were closed by editing in Consed, by PCR and by Bubble PCR primer walks (J.-F. Chang, unpublished). A total of 605 additional reactions and 15 shatter libraries were necessary to close gaps and to raise the quality of the finished sequence. Illumina reads were also used to correct potential base errors and increase consensus quality using a software Polisher developed at JGI . The error rate of the completed genome sequence is less than 1 in 100,000. Together, the combination of the Illumina and 454 sequencing platforms provided 199.9 × coverage of the genome. The final assembly contained 248,918 pyrosequence and 395,536,860 Illumina reads. The genome consists of a 2,526,590 bp long circular chromosome with a G+C content of 38.3% (Table 3 and Figure 3). Of the 2,399 genes predicted, 2,346 were protein-coding genes, and 53 RNAs; 85 pseudogenes were also identified. The majority of the protein-coding genes (75.2%) were assigned a putative function while the remaining ones were annotated as hypothetical proteins. The distribution of genes into COGs functional categories is presented in Table 4. 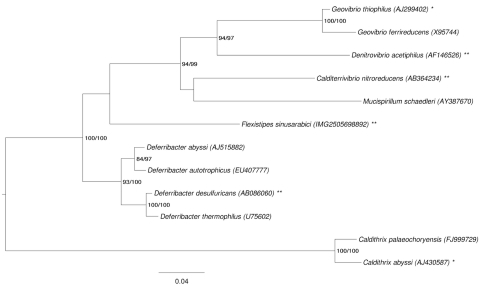 Lacking an available genome sequence of Deferribacter abyssi, the species yielding the highest score, the following comparative analyses were done with D. desulfuricans  (GenBank AP011529, AP011530) and Calditerrivibrio nitroreducens (GenBank CP002347, CP002348) , the phylogenetically closest organisms for which a genome sequence was available. 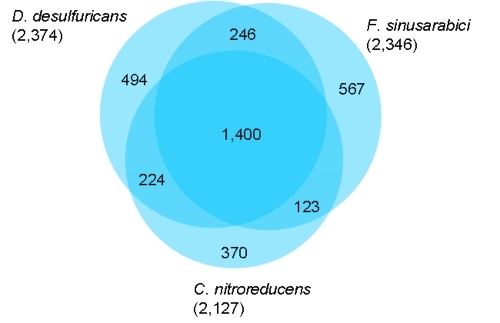 The genomes of F. sinusarabici, D. desulfuricans and C. nitroreducens are similar in sizes (2.5 Mb, 2.5 Mb and 2.2 Mb, respectively) and have a similar, quite low G+C content (38%, 30% and 36%, respectively). Whereas F. sinusarabici has no plasmid, D. desulfuricans harbors a 5.9 kb plasmid; C. nitroreducens contains a 30.8 kb megaplasmid. An estimate of the overall similarity between the three genomes was generated with the GGDC-Genome-to-Genome Distance Calculator [40,41]. This system calculates the distances by comparing the genomes to obtain HSPs (high-scoring segment pairs) and inferring distances from a set of formulas (1, HSP length / total length; 2, identities / HSP length; 3, identities / total length). Table 5 shows the results of the pairwise comparison between the three genomes. Pairwise comparison of F. sinusarabici, D. desulfuricans and C. nitroreducens using the GGDC-Calculator. The comparison of the F. sinusarabici and D. desulfuricans genomes revealed that 5.9% of the average of both genome lengths are covered with HSPs. The identity within these HSPs was 83.2%, whereas the identity over the whole genome was only 4.9%. Similar results were inferred for F. sinusarabici and C. nitroreducens (Table 5). The genomes of D. desulfuricans and C. nitroreducens show a significantly higher degree of similarity with 9.9% of the average of both genomes are covered with HSPs of 83.3% identity. The identity over the whole length of the genomes was 8.3%. These values corroborate the relationship between the three organisms as shown in the 16S rRNA-based phylogenetic tree in Figure 1, as there is no bootstrap support that F. sinusarabici is closer related to either C. nitroreducens or D. desulfuricans. The fraction of shared genes in the three genomes is shown in a Venn diagram (Figure 4). The numbers of pairwise shared genes were calculated with the phylogenetic profiler function of the IMG/ER platform . The homologous genes within the genomes were detected with a maximum E-value of 10-5 and a minimum identity of 30%. Roughly 61% of all genes in the genomes (1,400 genes) are shared by all three genomes, with about equal numbers of genes (224 and 246) shared on a pairwise basis by F. sinusarabici and D. desulfuricans or by D. desulfuricans and C. nitroreducens, respectively, and to the exclusion of the third genome. Within the 567 unique genes of F. sinusarabici that have no detectable homologs in the genomes of D. desulfuricans and C. nitroreducens (under the sequence similarity thresholds used for the comparison) the 86 genes (3.7% based on the whole gene number) encoding transposases appear to be noteworthy. Venn diagram depicting the intersections of protein sets (total number of derived protein sequences in parentheses) of F. sinusarabici, D. desulfuricans and C. nitroreducens. A remarkable difference between the compared organisms is their motility. Whereas F. sinusarabici is described to be non-motile, D. desulfuricans is motile by twitching  and C. nitroreducens is also described to be motile . The mechanism of twitching motility is still unknown but it is thought that moving across surfaces is caused by extension and retraction of type IV pili. A set of genes that is responsible for twitching motility was identified in several organisms; in Pseudomonas aeruginosa a gene cluster involved in pilus biosynthesis and twitching motility was characterized, the gene products of this gene cluster show a high degree of sequence similarity to the chemotaxis (che) proteins of enterics and the gliding bacterium Myxococcus xanthus . A closer look into the genome sequences of F. sinusarabici, D. desulfuricans and C. nitroreducens revealed the presence of different gene sets coding for chemotaxis proteins. In contrast to D. desulfuricans and C. nitroreducens, F. sinusarabici lacks four che genes (cheB, cheR, cheV, cheW). In P. aeruginosa a mutation in the pilI gene, a homolog to cheW, lead to a blocking of pilus production . It can be assumed that the missing cheW gene in F. sinusarabici might be responsible for the non-motility of the cells, despite the rather large number of 36 genes annotated in the cell motility category of table 4. We would like to gratefully acknowledge the help of Maren Schröder (DSMZ) for growing F. sinusarabici cultures. This work was performed under the auspices of the US Department of Energy's Office of Science, Biological and Environmental Research Program, and by the University of California, Lawrence Berkeley National Laboratory under contract No. DE-AC02-05CH11231, Lawrence Livermore National Laboratory under Contract No. DE-AC52-07NA27344, and Los Alamos National Laboratory under contract No. DE-AC02-06NA25396, UT-Battelle and Oak Ridge National Laboratory under contract DE-AC05-00OR22725, as well as German Research Foundation (DFG) INST 599/1-2. Garrity GM, Holt JG. Phylum BIX. Deferribacteres phy. nov. In: Garrity GM, Boone DR, Castenholz RW (eds), Bergey's Manual of Systematic Bacteriology, Second Edition, Volume 1, Springer, New York, 2001, p. 465. Huber H, Stetter KO. Class I. Deferribacteres class. nov. In: Garrity GM, Boone DR, Castenholz RW (eds), Bergey's Manual of Systematic Bacteriology, Second Edition, Volume 1, Springer, New York, 2001, p. 465. Huber H, Stetter KO. Order I. Deferribacterales ord. nov. In: Garrity GM, Boone DR, Castenholz RW (eds), Bergey's Manual of Systematic Bacteriology, Second Edition, Volume 1, Springer, New York, 2001, p. 465. Huber H, Stetter KO. Family I. Deferribacteraceae fam. nov. In: Garrity GM, Boone DR, Castenholz RW (eds), Bergey's Manual of Systematic Bacteriology, Second Edition, Volume 1, Springer, New York, 2001, p. 465-466.